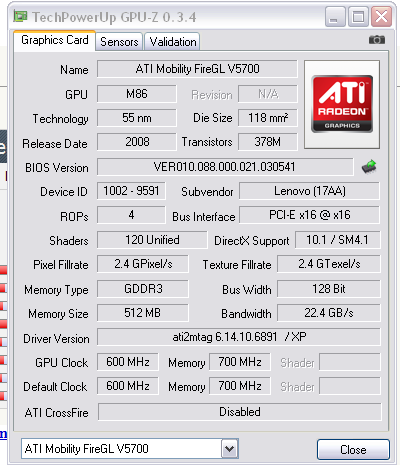 The ATI Mobility FireGL V5700 is a professional graphics adapter for laptops / mobile workstations. It is based on the Mobilty Radeon HD 3650 chip but features professional and certified drivers. Furthermore, some features are enabled only in the FireGL line (like AA lines). Because of optimizations for OpenGL, even entry level FireGL cards can beat high end consumer graphic cards in some applications / benchmarks. The FireGL V5700 is built in 55nm and consists out of 378 Mio transistors. Because of the 120 unified shaders and the 128 Bit memory bus, the performance can be positioned in the middle class. Because of the Avivo video engine, the GPU is able to accellerate the decoding of HD videos.